After the success of the 1946 race, Tony Hulman and Speedway President Wilbur Shaw knew they owed a lot of people thanks for getting this seemingly insurmountable task accomplished. 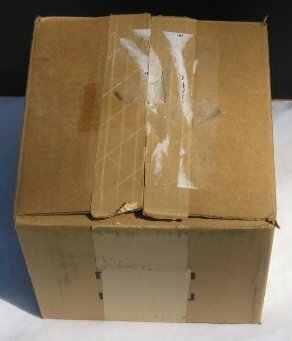 It is *believed the first item they released as a gift of appreciation was a Zippo lighter with a raised wing and wheel on one side and in green letters on the other side "From Tony & Wilbur". 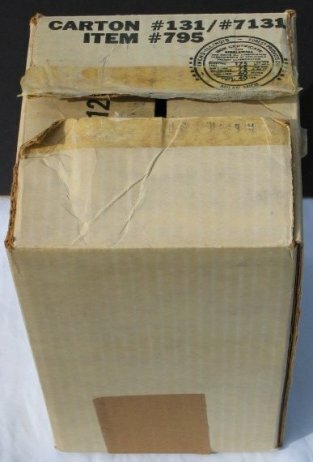 A similar lighter with the wing and wheel with flags engraved on one side and "From Tony & Wilbur" in black on the other was more than likely released in the early 50's. Neither version of the Zippo lighter are easy to find but if one had to choose between the two, the earlier version would be the toughest. 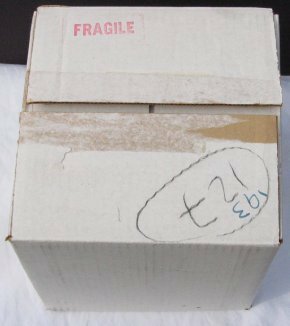 Those lighters in pristine condition will command a higher value than those which have been used or are damaged. If either version has the box it enhances the value further and if the Zippo guarantee paper sheet is present, the value is further enhanced. For 1947 a bronze ashtray measuring 6 1/2" by almost 5" and made by Bastian Brothers, the same folks who made the badges, with the 1947 pit badge (the 1946 Novi) in the middle (the number area has been cut off and the badge soldered to the ashtray) with "Indianapolis Motor Speedway" engraved at the top was produced. 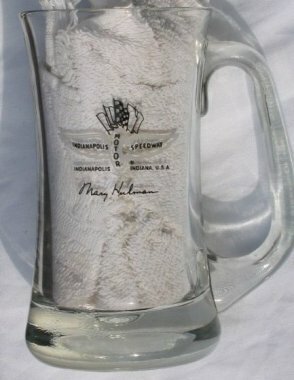 There is a version with "Clabber Girl Special Terre Haute, Indiana" below the IMS engraving. Tony Hulman owned the Clabber Girl Baking Powder company at this time. The plain versions may have been given out around Christmas time or distributed through out the year. The *Clabber Girl versions were supposedly given to employees etc. of the Clabber Girl Co. or possibly to personal friends of Tony. The Bastian Bros. mark/logo(s) are located on the back in the shaded area. For 1948, a small clipboard measuring 4" x 6" was produced. On the clip part at the top is again the pit badge for that year, in this case the wing and wheel, with the number cut off and the badge soldered to the clip. As IMS is already on the badge, there was no need to engrave it. 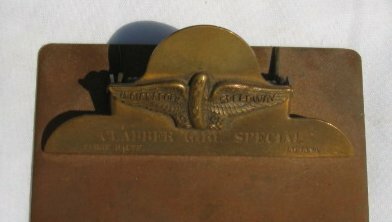 Again there is also a Clabber Girl version which reads, “Clabber Girl Special” and below that, “Terre Haute Indiana”. Distribution* is assumed the same as in 1947. 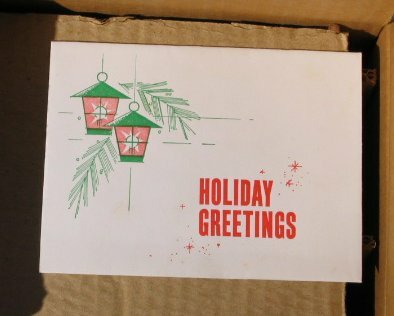 A card is with the 1948 clip board which reads "1948 Indianapolis Motor Speedway", but it is not certain if this card was a Christmas card or just a card to denote this is from 1948. The Bastian Bros. mark/logo(s) are located under the bar for the spring behind the clip. The back has green felt applied to the entire surface. 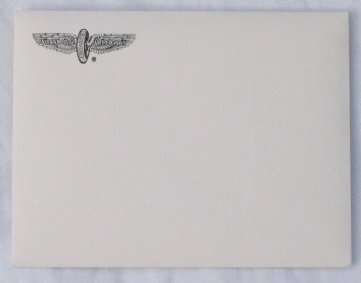 There is a 9" letter opener with the 1948 badge on the handle (same idea as the clip board), but it is uncertain as to when they were released i.e. it could've been for *1949 as nothing has been found for 1949 or it could’ve gone with the 1948 clipboard. The Bastian Bros. Mark is located on the back toward the larger end in the shaded area. The 1947 ashtray and 1948 clipboard and the letter opener can be found with patience with the clipboard and letter opener being the toughest to find. Bright, unpolished examples do command a higher value than polished, tarnished or worn examples. If the clipboard is missing the green felt on the bottom, the value is decreased. 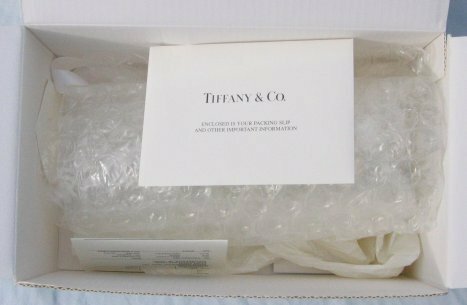 If the ashtray or clipboard is the Clabber Girl version, this only enhances the value as does having the box for any version of these items. 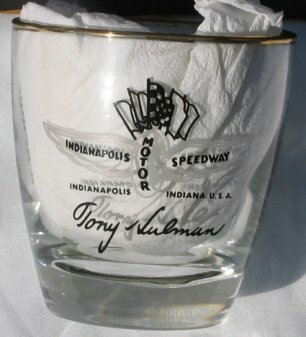 In 1950, the Speedway began sending sets of glasses out at Christmas time to lap sponsors, employees, vips, friends etc. 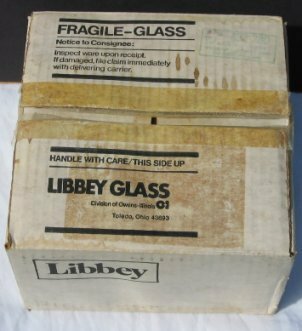 they were made by the Libbey Glass Co. and usually came it sets of 4, 6 or 8 and had a Christmas card. 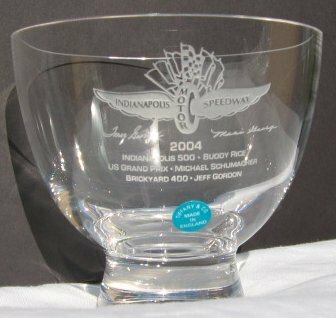 Libbey made glasses for the Speedway into the 1990's and for most years, the winners from 1911 through the current year will be on one side and the other side will have the wing & wheel logo and signatures. Wilbur Shaw and Tony Hulman from 1950 through 1954 and Tony Hulman from 1956 through 1977. The 1955 ashtray has no signatures. All have *gold rims from 1950 through 1980 with the exception of 1955. If one encounters glasses missing the gold on the rim, one too many trips through the dishwasher is the likely culprit. 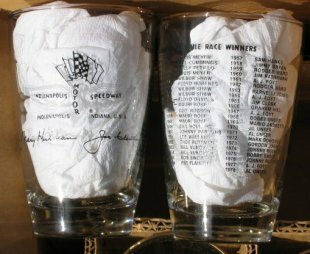 To settle any confusion over what year a glass is from, if 1950 winner Johnnie Parsons is listed as the last winner on the glass, then this is a 1950 glass NOT 1951. 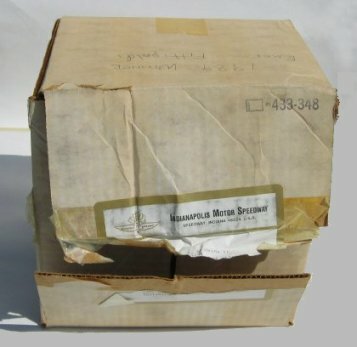 Different types of glasses were sent each year through 1980 with the exception of 1955 which was a four sided ashtray with the winners on the sides and a representation of the new museum in the middle. There is no signature on the ashtrays. An error has been discovered with the 1955 ashtray. On some ashtrays the winners from 1923 through 1931 have been duplicated as seen in the picture below right. It is uncertain how many were produced before the error was discovered and corrected. With the passing of Tony Hulman in October of 1977, the signature now changes to Mary Hulman and Joe Cloutier for 1978. 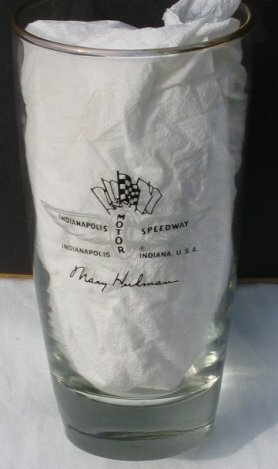 From 1979 through 1988, Mary Hulman is the only signature. 1980 would mark the last year for gold to appear on the rims. 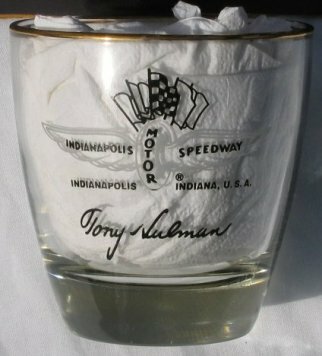 In 1981, Bobby Unser wasn't declared the winner until October so the Speedway decided not to issue glasses for 1981. Many had heard the Speedway wanted to quit sending glasses and this would make for a perfect opportunity to stop. 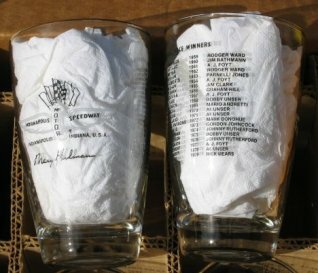 However in 1982, two beer mugs were released with one having Gordon Johncock as the winner in 1982 and one with Bobby Unser as the winner in 1981. 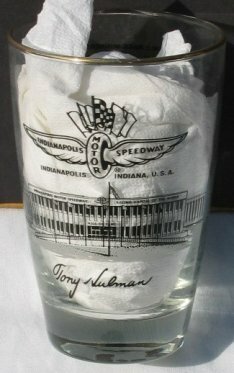 In 1983, the Speedway made a change to the glass sets which they'd been doing for thirty plus years and went to a single item, a wine carafe. It has the wing and wheel logo and signature on one side and all the winners listed on the other. 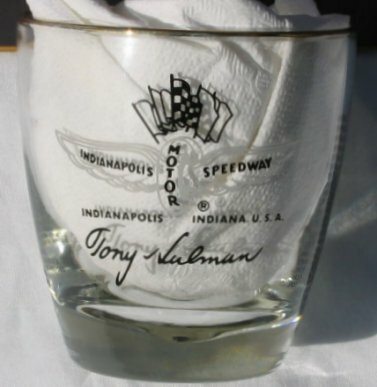 The Speedway went back to a set of glasses in 1984 and did so through 1989 with the exception of the rectangular tray in 1985. 1984 marks the first time since 1950 where only the winner appears instead of the complete list. This is also true for 1987. 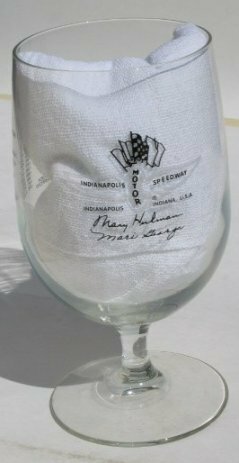 Mari George's signature now appears along with Mary Hulman in 1989 through 1998. 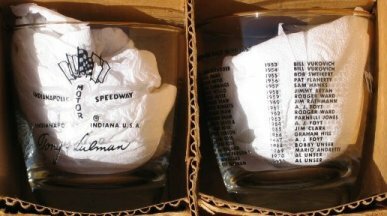 In 1994, the winners of the 500 are listed on the larger bowl and the Brickyard 400 winner is listed on the smaller bowl. For 1994 through 1999, only the 500 winner and the 400 winner are listed. From 2000-2007 the Formula One winner was added, from 2008 through 2015 the MotoGP winner and beginning in 2016 the Red Bull Air Race winner. 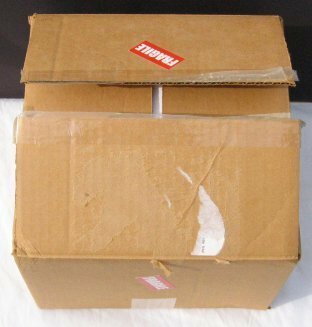 In 1995, the winner of the Indianapolis 500 is on one side, the Brickyard 400 winner is on the opposite side and the wing and wheel logo and signatures on the side in between. This same pattern also appears on the 1999 glasses. 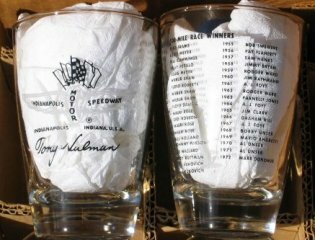 In 1996, the winner of the Indianapolis 500 is on one glass, the Brickyard 400 winner is on the other with both having the wing and wheel logo and signatures on the opposite side. The jug has the winner of the Indianapolis 500 is on one side, the Brickyard 400 winner is on the other and the wing and wheel logo and signatures on the side in between. 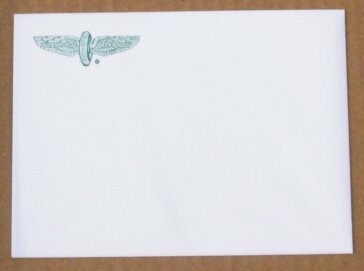 This same pattern is seen in 1998 as well except the wing and wheel logo and signatures appear only on one side. 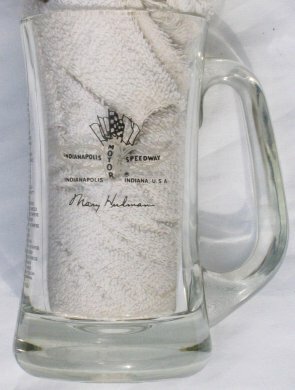 In 1999, the signatures of Mari and Tony George now appear on glassware. 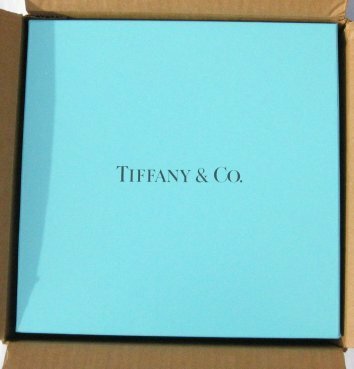 In 2000, the Tiffany Company takes up production of glassware. 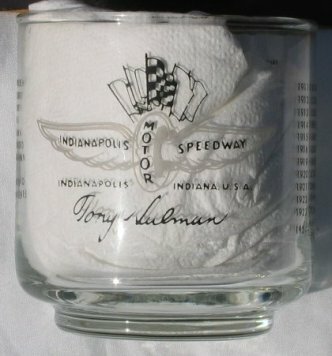 For 2000, the Indianapolis 500, Brickyard 400 and Formula One winners are listed on one side of the glass with the wing and wheel logo and signatures on the opposite side. 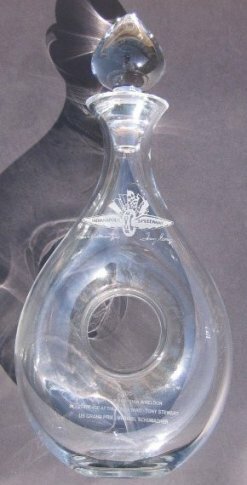 The decanter has the Indianapolis 500, Brickyard 400 and Formula One winners along with the wing and wheel logo and signatures on the same side. Beginning in 2001 the winners, logo and signatures all appear on the same side. 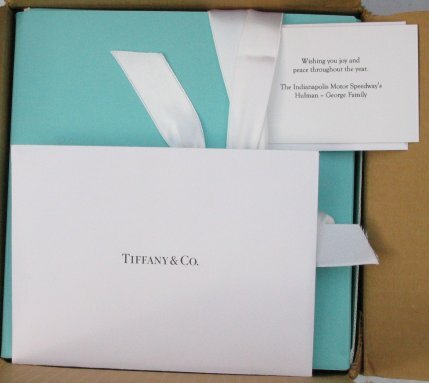 In 2005, Lenox takes over the production of the glassware from the Tiffany Co. 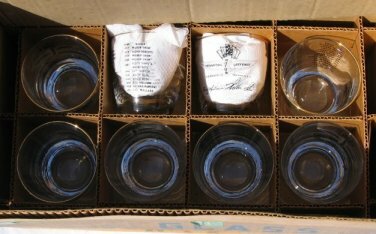 Individual glasses from 1950 through 1980 seem to be relatively common and can be found with patience. The exception is the 1955 ashtray as people only received one so if it was broken, that was it. 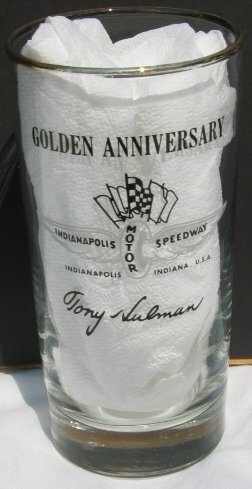 When the Speedway changed in 1982 to only two mugs and the one wine carafe in 1983, they become tougher to find with the exceptions being the 1985 and especially the 1990 trays - there seem to be more of them than other years for some reason. The Tiffany glassware from 2000 through 2004 is quite expensive to make and can be tough to find. 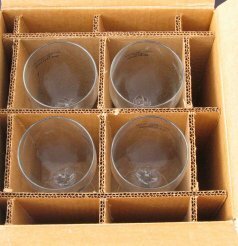 The 2005 Lenox glassware will also be tough to find. Other years which one may find tough to find are from the year when the Corvette (1978, 1986, 1995, 2002, 2004 and 2005), Camaro (1967, 1969, 1982 and 1993) and 1989 Pontiac Turbo Trans Am were the pace cars. 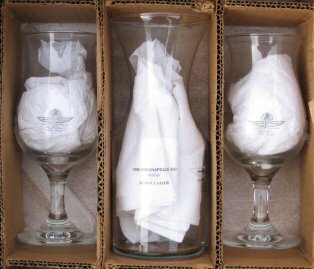 Having the complete set of glasses with the original box enhances the value and if the Christmas card is also there, it is enhanced further. 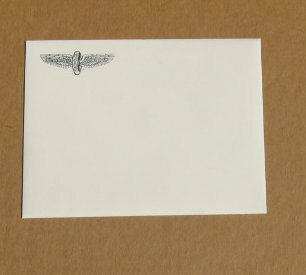 It is *believed the Christmas cards were a stamped signature(s), but it is possible some may have been personally signed and this would only add to the value. 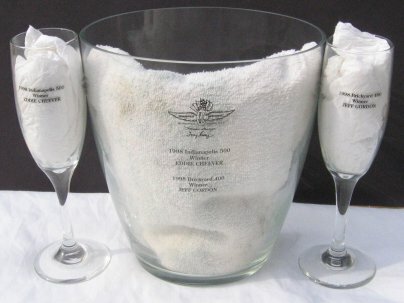 Beginning in 2009, the Speedway limited glassware distribution and further limited it in 2011 making the 2009 and subsequent years very hard to find.